The community footprint of AFL Mackay will extend across the Central Highlands district in 2019 with the return of a recent senior premiership winning club. After a two-year hiatus, the Moranbah Bulldogs will compete once again in the AFL Mackay Allied Pickfords Senior Men’s Competition after being grand finalists in 2016 and in the Senior Women’s competition. The Bulldogs, who are situated just over two hours from central Mackay, failed to field a senior side over the past two years but boast a strong history in the sport having previously won the premiership in 2014. Moranbah Bulldogs President Stephen Thompson was eager to embark on a new chapter in the club’s history this season. “It’s amazing to be back in the competition. We’ve put a lot of work into it,” Thompson told aflq.com.au. “We’re hoping mainly to get a team on the field to start with. We’ve got a good mix of players, so we hope to be competitive. 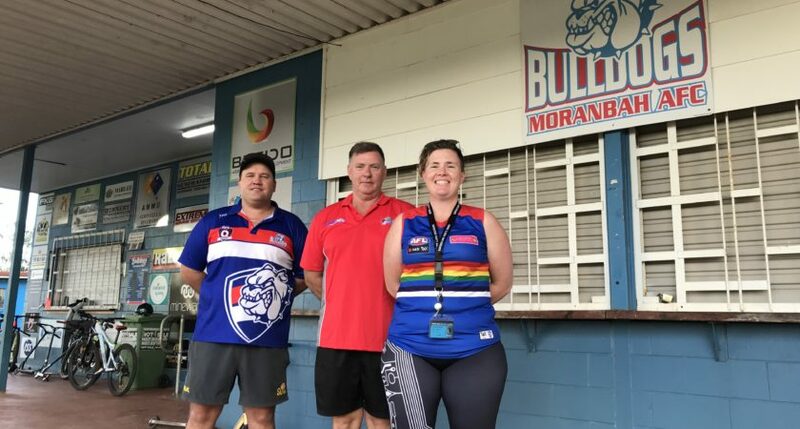 As a mining town, Moranbah – whose residents tally close to 9000 – was affected significantly by the mining downturn which began in 2013 and the Bulldogs’ senior team was no different. Both the town and football club relied on fly in-fly out workers and numbers at the club dropped during the downturn and ultimately hampered their ability to field consistent numbers. Australian Rules football didn’t cease altogether in Moranbah though as the club continued to field junior and youth teams in the competition. Just weeks out from the new AFL Mackay season, numbers at the Bulldogs remain steady in all grades. Over 40 players have registered with the senior team along with 30 in the senior female team and 35 in the Under 12s rank. Bulldogs Secretary Terese Wilcock said the club’s strong culture was a driving force in their inclusion to the football scene. “We have a really good culture here in that we just support each other and help each other out,” Wilcock said. AFL Queensland Mackay Competition Manager Paul Scullie welcomed the return of the Bulldogs to senior competition. With a bye in Round 1 of the season, Moranbah’s senior return to the AFL Mackay Allied Pickfords Cup will properly commence in Round 2 when they host the North Mackay Saints at Stevenson Sports Park. Find out more about the AFL Mackay Allied Pickfords Cup here.